Several Alberta post-secondary institutions gave tens of thousands of dollars in illegal donations to the provincial Progressive Conservative party, in one case with the party's direct knowledge, reveals a CBC News investigation. Several Alberta post-secondary institutions gave tens of thousands of dollars in illegal donations to the provincial Progressive Conservative party, in one case with the party’s direct knowledge, reveals a CBC News investigation. 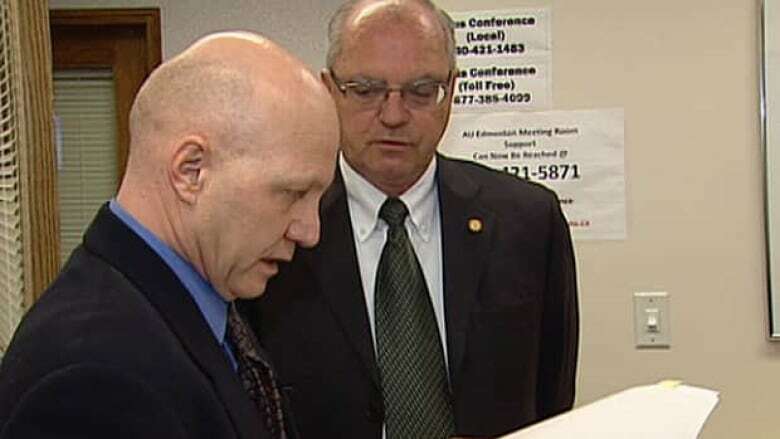 Athabasca University, Portage College and Grande Prairie Regional College variously used taxpayers’ money to attend numerous Conservative fundraisers between 2004 and 2011, including dinners and golf tournaments, show documents obtained through Freedom of Information. "It is pork-barrel politics," said Athabasca political science professor Jay Smith. "It's a means of buying influence and it is clearly unacceptable." It is against the law in Alberta for publicly-funded institutions to make political donations. Between 2006 and 2008, Athabasca University spent $10,675 on Conservative fundraising events. Portage College spent $7,675, while Grande Prairie Regional College spent more than $5,000 between 2007 and 2010. The three institutions say all the public money used for political donations has been repaid either by the people who attended the events or by the Conservative party. Emails and other documents show the post-secondary institutions maintained a close relationship exclusively with the ruling Conservative party, and that their governing boards and senior executives actively supported this exclusive relationship. In hundreds of pages of documents there is not a single reference to communications with, or support for, another political party. "For them, it’s a symbiotic relationship," Wildrose MLA Paul Hinman said. "If I am doing well, you are doing well. "They have entrenched this behaviour and they do not see anything wrong with it," Hinman said. "The end justifies the means. This is the way you carry out business with the Tory government." In October, a CBC News investigation revealed that municipalities and counties across Alberta had made illegal donations to the Tory party for years. Wildrose and Liberal researchers subsequently uncovered dozens of cases of questionable donations. In January, Wildrose also revealed the University of Lethbridge had donated $15,000 to the Tories. CBC News has learned Alberta Elections subsequently sent letters to every post-secondary institution in the province warning them about their obligations under the law. Alberta’s chief electoral official is now investigating more than 50 cases involving municipalities and post-secondary institutions. It is not known if these recent cases uncovered by CBC News are part of that investigation. The documents show Tory fundraisers sent direct email solicitations to university executives and boards. The post-secondary institutions, in turn, bought entire tables at premiers’ dinners, for as much as $4,500, and the 10 seats were filled with senior executives, including the president, and board members, who are appointed by the Conservative government. Portage College and Athabasca University also paid for Tory MLAs and ministers to attend dinners and golf tournaments as their guests. Athabasca University board chair Barry Walker said the university made the donations because it was "trying to develop a relationship with the government at the time, trying to further our needs as far as funding and the like. Political scientist Jay Smith said that is the essence of pork-barrel politics. "You’re trying to get an inside track to access money by giving the government money," he said. "And all this is public money. It is circular, it is insidious and it is wrong." The documents show at least one Conservative party official knew public money was being used for political purposes. Carol Lund is head of Athabasca University’s secretariat and as such, is responsible for administration of its policies and procedures, including its policies governing conflict of interest. Lund is also president of the Athabasca-Redwater Conservative riding association. Documents show Lund personally signed off on several requisitions for Tory fundraisers, including for the Athabasca-Redwater riding association. Lund also actively recruited university executives to attend these functions. Athabasca-Redwater MLA Jeff Johnson declined an interview request. Lund did not respond to a CBC interview request. In January, CBC News made Freedom of Information requests to 10 post-secondary institutions in Alberta. Three have provided documents so far. Red Deer College, Olds College and the Southern Alberta Institute of Technology say they found no records of any political donations. The University of Calgary, the University of Alberta and the Northern Alberta Institute of Technology have yet to respond. The University of Lethbridge charged nearly $1,800 in processing fees which it refused to waive, saying the information is not in the public interest, even though eight other institutions had either assigned no fees, or waived the fees because they agreed the information was in the public interest. Political scientist Jay Smith says these recent revelations about pork-barrel politics involving post-secondary institutions is a watershed moment in the province’s democracy. "This is now a test for the people of Alberta," Smith said. "If they are willing to accept this, then I would say democracy is in serious jeopardy in this province because the ultimate custodians of the democratic process are the electorate. "And if they accept this, what is left in terms of a healthy democratic process? We are in admitting that things are rotten, and that it is OK."